I liked your fast, friendly service. You were all knowledgeable in the area of bankruptcy. Your treatment of me as a client was spectacular! You were great at promptly responding to my questions and concerns. I loved that you provided courteous and quick responses to all my questions. I have worked with Seth and he is the utmost professional in how he works with his clients. If you need an attorney you can trust I would highly recommend the Law Office of Seth Hanson. Everyone was very professional and efficient. Seth, and everyone that I had contact with were very knowledgeable. I was very pleased with how we were treated by his staff. My questions were always answered promptly. I was very pleased with the service I received and would not hesitate to refer someone to your firm. You were very open and answered all of my questions. You never made me feel like I was asking a dumb question. I was comfortable with your knowledge of the law. It was hard for me to make this decision to move forward in my life. Everyone was friendly to me and respectful. Non-judgmental. Every question I asked was answered promptly and appropriately. I would recommend you. I found the firm's representation to be more than what I expected. I was always kept in the loop, all my questions were answered (whether or not I asked more than once the same question), and I felt completely supported by the firm staff when going through this (at times) scary ordeal. Thank you again. I liked that you had very friendly, caring staff. You were all very knowledgeable. Your treatment towards me was excellent and you quickly responded to all my concerns. If a friend asked of your overall impression, I would say that we were very impressed and we would recommend you to them. Recently Nerdwallet posted it’s 2018 study of household debt. The study revealed the American households have 5% more credit card debt over the 2017 year. The study attributes this increase to a rise in household expenses that is far more rapid than the rise in average income. This trend is causing American families to live beyond their means and rely more heavily on credit to supplement the gap between their income and expenses. Average credit card interest rates are at their highest levels in two years, topping 17% in October 2018. Outstanding credit card balances have also increased, reaching $944 billion, according to the report. The report also found that credit card debt varies with each generation. Millennials carried the least, at roughly $4,500. For those aged 45-54, the debt load significantly increases, to more than $8,500. Those aged 55-64 owed, on average $8,100. 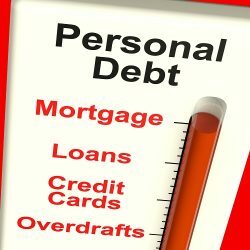 If your household is struggling under the weight of consumer debt, contact your Modesto bankruptcy attorney for more information. Will Bankruptcy Stop Lawsuits And Garnishments? We are a debt relief agency. We help people file for chapter 13 bankruptcy and chapter 7 bankruptcy in California under the bankruptcy code.